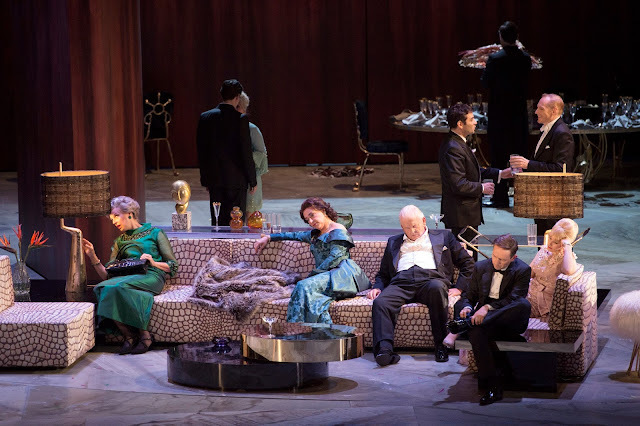 Coming relatively late in the run to Thomas Adès’s new opera, The Exterminating Angel, I was unable to insulate myself entirely from what others had thought about it. I found people whose judgements I respect both fulsome in praise and in negative criticism. Seeing it here in Salzburg, I found myself in the somewhat unaccustomed situation of the juste milieu; I certainly did not find it a terrible work, far from it, but nor did I hear – or indeed see – anything in it that suggested it might hold the key to the operatic future. I was happy to have seen it, and should happily see it again, in order to see whether my mind would change; however, I cannot imagine travelling to do so. In what follows, I shall try to explain why, as well as paying tribute to the excellent performances from all concerned; I have little doubt that the opera received as fine a baptism as anyone could reasonably have hoped for. Above all, I cannot answer the question ‘why an opera?’ To my shame, I had not seen Buñuel’s film before, but seeing the opera has sent me back to watch it. Even from a single viewing, it seems fully to merit its hallowed status. It is far less clear to me that it merits the transformation into an opera. In a sense, the answer to my question is simply, ‘because its creators wanted it to be’. It seems to me, though, that a great deal is lost and the work that emerges is, in some respects, not entirely free of sprawling self-indulgence. The cast is huge: in this case, a line-up of many of Covent Garden’s finest regular singers. (The production will move to London next year.) If one is going to transform a film into an opera, is it perhaps not better to offer more radical surgery? The stilted quality, even the superficiality, of high bourgeois conversation is clearly part of the point: as Bunuel, quoted in dramaturge, Christian Arseni’s admirable programme note, put it, ‘It wouldn’t be the same if I had used working-class characters, because they would have found a solution to their incarceration. … Because workers are more in touch with life’s difficulties.’ I cannot say that I found that critical element come to the fore here, though; is there perhaps too much all-purpose irony? I certainly would not go so far as to say that operatic characters need to elicit sympathy, but often it helps. 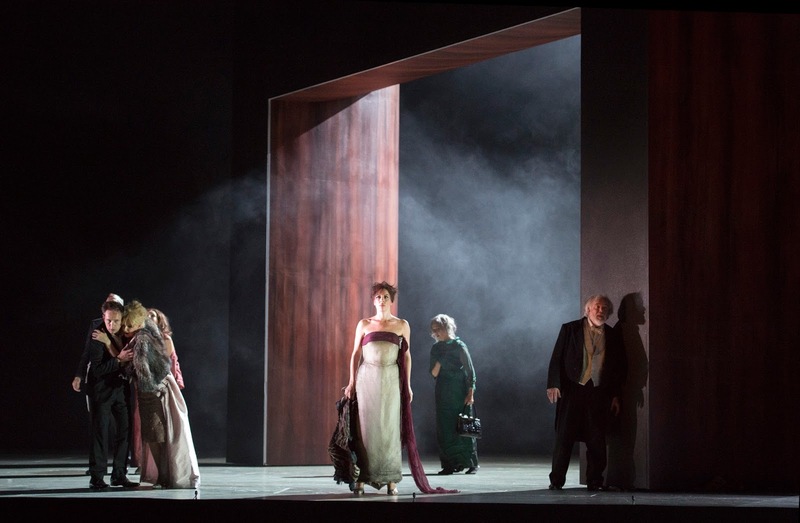 Here, it is the Doctor – played in typically barnstorming fashion by John Tomlinson – who offers a voice of reflection, of reason; the problem is that he often seems in danger of being in a different opera altogether. The first act, then, seemed pretty tedious to me in the theatre. The dramatic exposition does not lend itself especially well to musical treatment, although, as always with Adès, there are splendid vignettes: for instance, Blanca at the piano. (The request for her to play some Adès should really have been cut, though. Tom Cairns’s libretto – he also directs – is generally skilful indeed, but an in-joke should be funnier than that.) 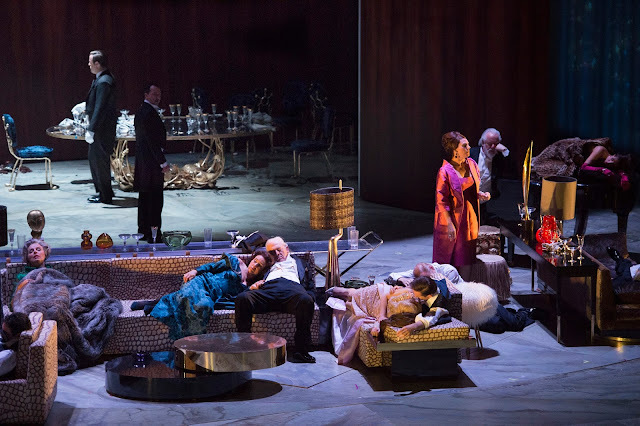 As the opera opens out, the composer’s exploration of situation and of relationship seems stronger, indeed more well-suited to conventional operatic writing. For, whatever this work is, it is not remotely experimental. Not that it need be, but it is far from clear to me that the operatic future, nor the better part of the operatic present, lies in neo-Verdian realism. Parody is, unsurprisingly, a strong presence. I could not help but wonder whether the Johann Strauss waltzes – intriguingly, Adès, according to an enlightening interview with Cairns and Arseni, hears them as asking, ‘Why don’t you stay a little longer? Don’t worry about what’s going on outside’ – might have been a little less directly introduced. ‘When panic breaks out among the guests in Act Two,’ the composer continues, ‘I have layered motifs derived and distorted from various Strauss waltzes over one another in a Fugue of Panic, transforming them into a kind of whirlpool.’ To me, by contrast, it all sounded too obvious; elements sounded to me rather more than motifs and transformation did not seem to go very far. The explanation sounded more interesting than the musical reality, although the latter was certainly – like the dinner guests, or at least their conception of themselves – not without charm. The tolling bells with which the work starts and ends frame it well enough, although – presumably deliberately – they betoken a seriousness, an apocalyptic presence barely perceptible elsewhere. Adès’s employment of the ondes Martenot (yes, you guessed it: the excellent Cynthia Millar), apparently his first ever use of an electronic instrument, as the voice of the exterminating angel is clear enough, but it often just sounds a bit peculiar, even appliqué. Perhaps that is the point; nevertheless, I am not sure that the musical elements or indeed the musico-dramatic elements, insofar as they might be separated, really cohere. And yes, as you may have expected, we have a chaconne at the end. Cairns’s productions looks wonderful in itself, Hildegard Bechtler’s set designs are imposing, her costume designs exquisite (as, dramatically, perhaps they should be). As with the work itself, I wondered whether something a little less straightforward might have helped one adopt more of a complex standpoint, both more distanced and more involved. But it does its job well enough, in terms that seem to be those of the opera itself. Adès’s conducting of the outstanding ORF SO sounded to me incisive and authoritative. To go through the cast, most of whom do not have very much to do, would not seem, at least on a first hearing, to do much more than repeat the cast list above. I mentioned Tomlinson earlier; others who stood out – and this may be as much a matter of their roles as anything else – were Amand Echalaz’s Lucía, Christine Rice’s Blanca, and Iestyn Davies’s Francisco, his vocal performance offering in its inflections a strong sense of the conflict in the character’s personality. Audrey Luna offered a trademark stratospheric performance, going far beyond Leticia’s role of the evening: Donizetti’s Lucia. Choral singing – there is not much of it – was excellent. Did the whole add up to more than the sum of its parts? Not really, although some of the parts were diverting enough.